Win Two Tickets to Lady in Red Ball! Know Your Website Contest! Explore our new, redesigned website for a chance to win two tickets to our 2019 Lady in Red Ball. Enter the contest here before Tuesday, November 6th at midnight. Good luck and enjoy our new website! It was great meeting so many women at the Sarasota Pride Festival. 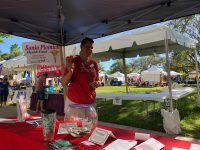 We were able to spread the word about SPHF and hope to help more women from Sarasota County manage their healthcare costs. A big thanks to our volunteers, Nancy, Jen & Maggie. Thanks, Sarasota! !